Heating and cooling systems are designed to be reliable and long-lasting. However, it’s not uncommon for your heating and cooling system to run need maintenance during its lifetime. Finding the right HVAC company is extremely important and should be a top priority once you’ve purchased a home. When it comes to fixing a current heating and cooling problem or installing a new heating and cooling system, hiring the wrong HVAC contractor can make your heating and cooling issues go from bad to worse. Why Choose Controlled Aire for Your Heating and Cooling Problems? Running into heating and cooling issues can be one of the most annoying and stressful problems a homeowner will experience. 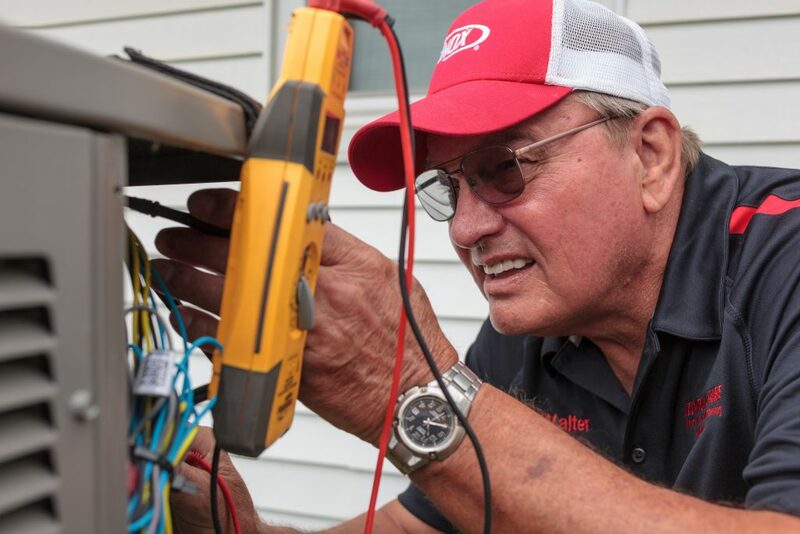 At Controlled Aire, our experienced HVAC professionals strive to deliver the best customer service in Moberly, MO by fixing any of your heating and cooling problems quickly and efficiently . Issues associated with heating and cooling systems are complex, and believe it or not, there are many heating and cooling companies who have made mistakes throughout the repair and installation process.You need skilled, esteemed experts who’ve been succeeding in the heating and cooling business for a long time. At Controlled Aire, we have been fixing HVAC issues for over two decades! Which Heating and Cooling Services Does Controlled Aire Offer? We service all heating and cooling system makes and models including air-to-air heat pumps. We also sell and install RHEEM hot water heaters, and have a showroom of products for you to see in our downtown Moberly store. In addition, we offer annual service contracts for cleaning, repair and installation needs. Whether you need simple vent cleaning done or heating and cooling repair/installation work, we are dedicated to providing the homeowners in Moberly, MO with the best heating and cooling services in the Mid-Missouri area! We also check on your heating and cooling equipment during the spring and fall seasons to make sure everything is in working order and providing you with proper heating and/or cooling year round. Our HVAC services extend past surface level, too. Our trained experts look for other improvement opportunities within your home to provide you with the comfort you deserve. . We will advise and consult you on alternative ways you can improve your heating and cooling efficiency. Additionally, we work with humidifiers, air filtration, fireplaces, outdoor grills and kitchens. We are a family-owned heating and cooling company in Moberly, MO. We have been solving HVAC problems for over 20 years, and we strive to continually improve our heating and cooling services! Our goal is to solve your HVAC problems and return your home to its ideal temperature. You should have your heating and cooling systems inspected and cleaned once per year. If you use disposable filters, you should have them replaced monthly, and if you use washable filters, you should wash them monthly. What Type of Heating and Cooling System Should I Get? It really depends on a number of different factors including cost, comfort, efficiency, maintenance, reliability and availability. Gas and Propane Heating Systems are convenient, affordable, safe and reliable. They are the most popular heating systems in the United States. Oil-heat systems produce the hottest flame of all the heating systems. They will heat your home faster. They are safe, and the oil is not explosive nor lethal. These systems also offer better protection from carbon monoxide poisoning than gas systems. Electric heating and cooling systems are one of the most efficient heating and cooling systems. These systems can provide up to four times more energy than they takes in. How Do I Know Which Size Heating and Cooling Unit My House Requires? Controlled Aire’s expert HVAC professionals can help you determine what size unit your home needs! Should I Set My Thermostat to “Auto” or “On”? It is recommended that you keep your thermostat on auto. This will allow the fan to operate only when the temperature requires making it the most efficient setting. If you are interested in receiving a free, no-hassle estimate, contact our team of experts today. We look forward to helping you and your family for years to come.